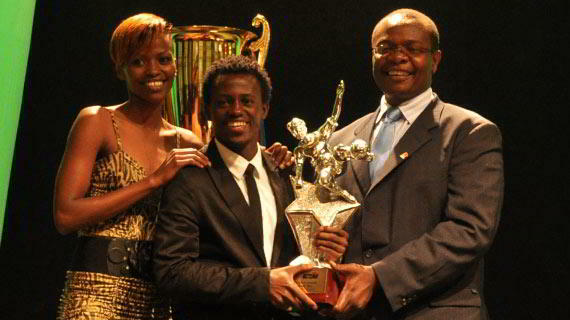 The 2011 KPL FOYA awards held in Nairobi on Wednesday evening marked the end of a successful football season with pomp and color. Mathare United’s sensational midfielder Kelvin Kimani was the man of the day as he walked home with a total of three trophies including the most coveted title of KPL 2011 Best player of the year. While receiving the top award, Kimani thanked his team mates at Mathare, coach Salim Ali and family for giving him the support throughout the year. He was flanked by his sister Janet Wanja-Kenya’s volleyball player.Kimani was also voted the best midfielder of the year and second best goal scorer with 11 goals. Stephen Waruru who scored 12 goals received the golden boot award, Pascal Ochieng was named the best defender while Congo United’s Rama Salim walked home with new player of the season. The event was graced by Sports Minister Dr.Paul Otuoma and his assistant honorable Kabando wa Kabando.Otuoma in his remarks congratulated KPL for a successful season saying the league was run in a professional manner but called on clubs to ensure dignity and calm prevails during all matches condemning pockets of violence witnessed in the stadium during the 2011 season. “Since the coming of KPL in 2007, football in Kenya has adapted a new face that has witnessed the game grow to admirable standards. We appreciate the efforts put in by KPL in partnership with SuperSport and the government will continue to offer all the needed support.” He said.